I have just returned from the 69th NECCC 2014 Annual Photography Conference held at U Mass Amherst. It was highly enjoyable for various reasons, but the most meaningful part of the conference for me started a while back. Towards the end of April 2014, I received a letter in an official NECCC envelope sent by Ray Guillette, MD. I thought it was related to one of the programs I was preparing to present and opened it with some level of curiosity since Ray would not send program related letters. To my big surprise, Ray was telling me that NECCC at its last meeting then had “elected to award you the title of Master Member, MNEC. This was totally unexpected but much appreciated and I told so to Ray in an e-mail message. I learned from his response that my friend Mike Di Stefano sponsored me and defended the nomination. I am honored to receive the title MNEC and would like to thank Mike, Ray, NECCC and everyone involved in making this decision. 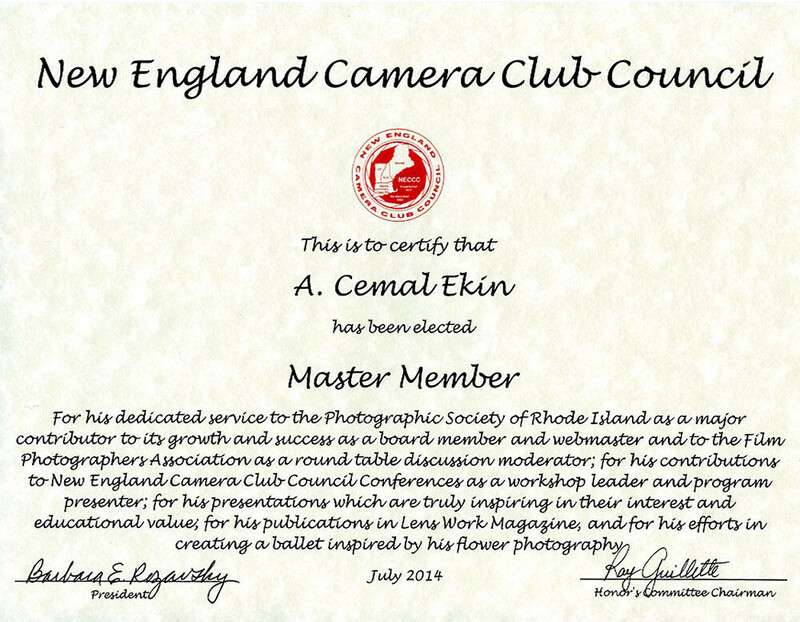 This honor is awarded for your dedicated service to the Photographic Society of Rhode Island, and the Film Photographers Association as a lecturer, mentor, and educator, for your contributions to NECCC Conferences as a workshop leader and program presenter, for your publications in LensWork Magazine, and for your work in creating a ballet inspired by your flower photography. Thanks for the kind words and the recognition given to my work. Getting back to the regularly scheduled program, I had a workshop “Black & White Conversion in Photoshop: A Vision Driven Approach”. It was a three-hour affair to which conference attendees chose to register and pay NECCC extra to be a part of the workshop. There were 11 participants and a very able workshop assistant Vega Buchbinder, thanks, Vega. For three hours we had fun learning various methods using Photoshop to achieve monochrome results, mainly B&W. The participants were very attentive, interested, delighted in learning these new tools, and endured my 20 minutes or so discussion of what photography is about, our perfectly imperfect visual system and other related subjects with essentially no photographs. In the end, I offered the workshop participants to work on the images they brought with them for about 30 minutes until the end of the period. They collectively said “we can do that any time, please go on” and so I presented other related matters. In the end, the feedback was very positive which is always satisfying for a teacher. I made two more presentations, each about 90 minutes, this time using Lightroom as the main conversion tool and the audience simply listening and asking questions, unlike the workshop where they followed me on their computers to experience the tools they were acquiring. In the first of these sessions, there were about 70-75 people in the audience and at the end of that, I received very favorable feedback as well. Later in the afternoon as I was walking around the vendor tables a man approached me and thanked me for a wonderful presentation and indicated that he would like to offer constructive criticism. I welcomed the opportunity and he said for the first 20 minutes or so he was worried that there would be no photographs shown and I would fill the time by talking. I told him that I appreciated his feedback which had very valid arguments but indicated that I did not want the presentation to be about me or my work, but rather about my helping them to discover their way of seeing. This morning, based on the feedback I received, I opened the session by sharing the feedback I mentioned above and then explaining some of my eclectic interests in photography ranging from salt and pepper shakers to ballerinas, from macro photography to architecture and many things in between. Then the presentation ensued as the day before. In all three presentations, I made new friends, new connections which may take me to their local clubs for presentations and/or workshops. One participant may even come to meet me for a 2-3 hour personal mentoring session. Let’s see what the time will show. The high point of all the conferences is the keynote speech, but there are keynote speeches and there are Keynote Speeches! The Canon sponsored Sam Abell was not only a great photographer with a process-oriented approach but he was an excellent deliverer of his highly tuned messages. At times he took us to his childhood learning photography from his father “Sammy, compose the picture and wait“, at times we went to the lands of the Aborigines, to Indian Reservations, to Japan, and many other settings as he searched for his suitable backgrounds, horizontal lines, and waited for the subject to fall into the frame. And, they did! His sense of humor and timing in delivery was perfect. After the speech, I waited in line to have a book I brought with me from home autographed and to buy another one. But, they ran out of the book and I put my name on their waiting list and when my turn came for the autograph I thanked him for his excellent presentation and how he separated photography from the camera and put it behind the eyes, between the ears. He was somewhat surprised, but in a very pleasant way, with my observation, smiled and agreed with my dissection of his speech. Then, using a fountain pen and in beautiful handwriting, he wrote: “For A. Cemal Ekin, with appreciation for your kind and insightful thoughts about photography, Sam Abell.” I will cherish the moment we shared. I hope at least some in the audience got his message that photography is not about cameras and lenses as music is not about tape recorders or digital recorders. I would like to repeat a view that I used in all three of my presentations “The common wisdom shared by photographers tells us that photography is about light, but I beg to differ. Photography is about seeing and making others see.” Sam Abell said essentially the same thing in his serious but peppered with a very keen sense of humor and a superb collection of photographs. Thank you, Sam! NECCC 2014 closed mostly with success and some ideas to be considered or reconsidered for next year. Thank you, Dennis Goulet, for a job well done! Here are some videos of Sam Abell that may make you remember parts of his speech and wisdom. Congratulations on your award. Well deserved. You’ve done so much for all of us at PSRI. I know I speak for everyone, when I say thank you, and congratulations. Thank you Sal, for your kind words.